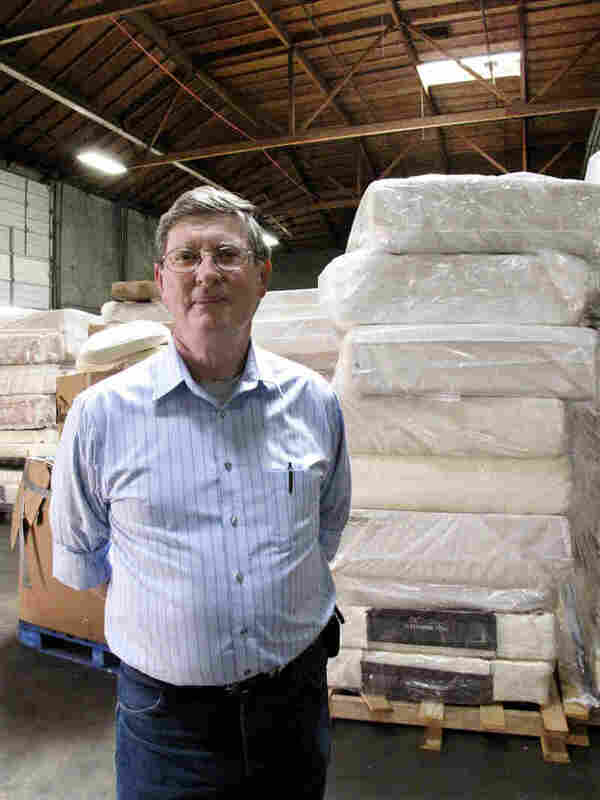 Turning Trash Into Cash To Help Nation's Poor A nonprofit that helps low-income families in Eugene, Ore., recycles mattresses to help bring in money. Its funding model is inspiring other nonprofits to start salvaging junk to support services for the poor. NPR's Pam Fessler reports on the tens of millions of Americans still struggling in poverty. 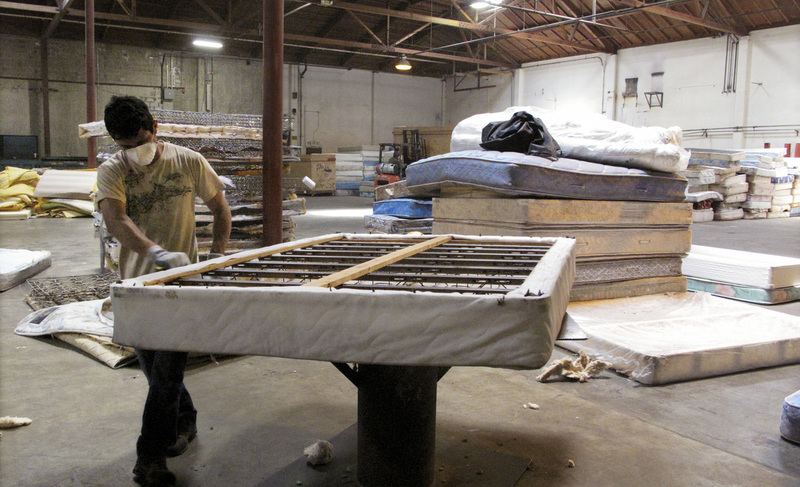 A worker dismantles a mattress at a recycling facility in Oakland, Calif. The material will be used to make carpet products and proceeds will help support the St. Vincent de Paul Society of Lane County, a nonprofit that helps low-income families in Eugene, Ore. The bad economy has hurt many nonprofits around the country, even as demands for their services have grown. That's certainly the case in Reading, Pa., which has been labeled the poorest city in America, with a poverty rate of more than 41 percent. Now, one local nonprofit, Opportunity House, hopes to salvage some of its services by salvaging junk. Opportunity House has provided day care, housing and other services to low-income families in Reading for many years. Because of state budget cuts in Pennsylvania, the nonprofit now gets less money to subsidize round-the-clock day care for parents who might not otherwise be able to work. To make matters worse, enrollment in the day care center is down because unemployment is so high, leaving the nonprofit with a $335,000 deficit. As a result, the charity's president, Modesto Fiume, did something he hoped he'd never have to do: He laid off 20 percent of his staff. "It was an absolutely horrible, horrible experience," he says. Seventeen low-wage workers, including teacher aides and assistant teachers, lost their jobs. Fiume knows that most of them will have a hard time finding other work. Terry McDonald, executive director of the St. Vincent de Paul Society of Lane County, is known to some as "the junkyard king" because he spends so much time trying to turn waste into cash. "It was a lot of tears and a lot of people upset because some of these people had worked with us for a number of years," he says. Fiume has also had to cut back day care services on Sundays. He says donations and volunteers help his organization make ends meet, but not nearly enough. Like many nonprofit leaders, Fiume is desperately looking elsewhere for help. One place he's looking is clear across the country, where another charity uses junk to help support services for the poor. At a 26,000-square-foot warehouse in Oakland, Calif., a worker with thick gloves puts a stripped-down box-spring mattress on what looks like a big meat slicer at a deli. As he pushes the mattress forward, the metal springs are sheered off the wooden frame. "He just literally pulled about a hundred staples out of that piece of wood," explains Terry McDonald, who oversees the operation. "But he did it with that machine in just a few seconds." McDonald is known to some as "the junkyard king," because he spends so much of his time trying to turn America's waste into cash. But his real job is executive director of the St. Vincent de Paul Society of Lane County in Eugene, Ore. The nonprofit has turned mattress recycling into a big business that supports services for low-income families. It's the largest mattress recycler in the country. 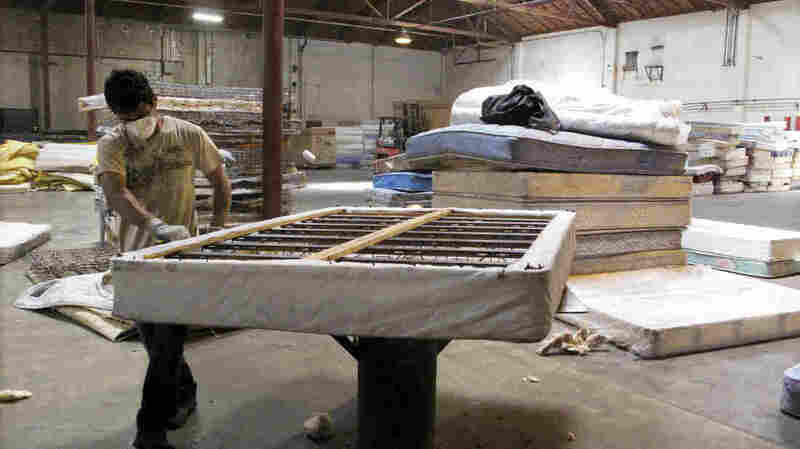 With one facility in Oakland and another in Oregon, it recycles about 175,000 mattresses a year. McDonald holds up a piece of quilted cloth and foam that's been stripped from one of the mattresses in the Oakland warehouse. "That material is recycled into commercial carpet," he says. "The next layer underneath, that is generally a polyurethane foam pad, and that's recycled into residential carpet pad." McDonald says about 90 percent of a mattress can be recycled into something else and sold. Mattress recycling is only one of many businesses, or social enterprises, that McDonald runs. St. Vincent de Paul Society of Lane County also operates thrift shops, repairs appliances and makes furniture — anything McDonald can think of to use stuff that other people discard. And the payoff is big. These enterprises raise enough money to cover more than half of the Oregon charity's $24-million-a-year budget. "The model is that if there's an opportunity to add value to something, let's do it," says McDonald. If you want to survive as a nonprofit ... then you have to kind of reinvent yourself. Modesto Fiume, president of Opportunity House, a nonprofit that helps low-income families in Reading, Pa.
That model is getting lots of attention these days, as nonprofits struggle to survive. The Robert Wood Johnson Foundation has given McDonald a half-million dollars to spread the word. He's already helped set up mattress-recycling operations in Orlando, Fla., and Bridgeport, Conn.
Now, he's talking to Opportunity House and officials in Reading about how they too might tap into trash. Fiume, Opportunity House's president, says a recycling facility would create "meaningful" jobs that pay above-minimum wages and provide health benefits. That would mean a lot in a city that's been bleeding jobs for years. Fiume knows it could also make Opportunity House less dependent on donations and government funds. "If you want to survive as a nonprofit and you want to continue to meet the needs of the folks who are most in need of support, then you have to kind of reinvent yourself," he says. "So that's what we're doing." Fiume is now trying to figure out the next step: where to get a warehouse, equipment and startup funds. For a nonprofit more accustomed to helping the poor than running a business, it's a whole new world.